Annabella at Cedar Glen is an award winning wedding and events venue located northeast of Huntsville, Alabama on three and a half scenic acres. At the heart of the property lies a 5,600 square foot Southern plantation style home surrounded by lush gardens. With the beautiful landscape, elegant architecture, picturesque bridge, and two outdoor ceremony areas to choose from, Annabella provides the perfect atmosphere to host your garden wedding and reception. Your reservation at Annabella includes many amenities that other venues charge extra for. These amenities include various indoor and outdoor tables, chairs, and white linens, festive outdoor lights, a sound system with both a cordless microphone and lapel microphone, ample free parking, a day-of wedding director, a host to assist and direct guests, and staff members for the duration of your event to assist with setup and cleanup. The Annabella house features bride and groom dressing suites with private baths, upstairs and downstairs garden rooms and a catering prep kitchen. Annabella can accommodate up to 175 guests for an indoor/outdoor event or up to 110 guests for indoor events. Furthermore, if your event is subject to inclement weather, the Annabella staff can move your event indoors in less than an hour at no additional charge. Karen and Danny Archambault are the proud owners of Annabella at Cedar Glen. The husband and wife team have hosted weddings, receptions, bridal showers, baby showers, corporate events, and Christmas parties both large and small at Annabella. Every occasion is hosted with the Archambault’s true Southern hospitality — it’s what they’re known for! They work hard behind-the-scenes so that you and your guests can enjoy your special day. 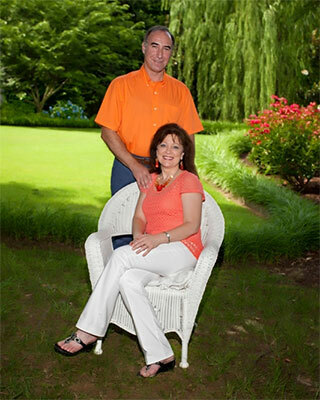 Danny, Karen, and their staff are personally dedicated to turning your dreams into cherished memories.